Aerolite Kustom Coach "Breeze" BT165 rv trailer. Light weight 2270 lbs dry weight easy towing and 16.5 ft long. Ideal for getting into small lake, river, forest and ocean campsites. Pop-out dinette makes a spacious interior. Stove, fridge, furnace, toilet/shower, outside shower and awning. New converter and 2 new 6 volt golf cart batteries for much longer battery life. 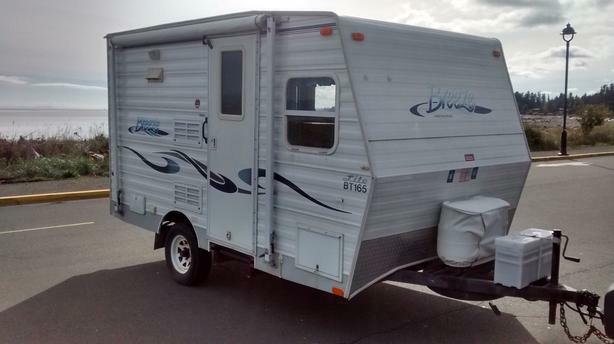 Trailer is a 2005 year model in excellent condition. Breathable cover for winter storage. Make phone replies to 778-420-5759 after 5:00pm.